Ian Hamer was a Welsh runner who came to Scotland to attend Heriot-Watt University in 1987 and stayed here until 1991. Like several others, such as the Irishmen John Jo Barry and Cyril O’Boyle, fellow Welshman Simon Axon and several Englishmen, he threw himself into the sport here and added to the quality of whatever event he ran in. Competitively he sought out the hard races and had top class results to show for it – he won the AAA’s 5000m in 1991 as well as the UK 5000m in the same year. It is clear from these few races – especially the second stage of the Edinburgh to Glasgow where he sped through the field from eighth to first – that he was an athlete of quality. His racing during the winter was intermittent with several races that he might have contested – eg Scottish Universities championship being uncontested, The following summer – 1988 – Ian ran in the SAAA 5000m at Crownpoint and finished fifth in 13:58.15 behind Neil Tennant, Paul Cuskin, Gary Nagel and B Rushworth and just ahead of Adrian Callan in 13:58.93. He had the reputation of being a fast finisher and his shoot-out with Adie Callan verified that. That was at the end of June and then on 10th July in the Inter-County Championships at Corby, he was third in the Mile in 4:17.6 having run 4:12.7 in the Heat. On 16th July he won the mile at Swindon in a BMC race in 3:59.9 with Alistair Currie in third just outside the 4 minutes in 4:00.5. Another finish with three men covered by 0.6 seconds. By the end of summer, he was ranked high in four track events. In the 1500 his best time was 3:46.1 (5th), in the Mile it was the 3:59.9 reported above (1st), in the 3000m it was 8:02.3 (5th) and his best 5000m was 13:58.0 (2nd). When they went into season 1988-89, Scottish athletes couldn’t plead ignorance of Ian Hamer’s abilities. In the Glasgow University road race on 5th November he finished second to Adrian Callan – 22:40 to Adrian’s 22:39 and third placed Paul Dugdale’s 22:40! Ian did not run in the Edinburgh to Glasgow that year but into the New Year – he had been third in the Scottish Indoor 1500m and he raced indoors again this year. On 11th January, in the East District Indoor Championships at Kelvin Hall, Hamer won the 1500m from Mark Fallows in 4:56.51. Ten days later, 21st January, in the Scottish Universities Indoor Championships at the same venue, he stepped up a distance to win the 3000m in 8:24.9 from David Donnet of Glasgow. On 16th February the event was the Scottish Civil Service Sports Council Indoor Championships where, running as a guest, he won the 3000m in 8:18.5. By the end of the indoor season Ian was 5th in the 1500m with a best of 3:52.07 and 8th in the 3000m with the 8:18.5 from the CSSA Championship. This led into a good summer of 1989. Ian had a run for Wales on 30th June in the Small Nations International in Antrim where he won the 5000m with Scotland’s Bobby Quinn third in 14:03.8. He won a 3000m at Loughborough on 25th July in 7:51.4 before heading back to Wales for a 1500m at Cwmbran on 5th August where he was first in 3:38.9. Eleven days late at the same venue in a BMC race over 800m Ian was third in 1:49.5 with another BMC race at Cheltenham on 8th September over a mile when he was again sub-4 – first in 3:59.1 before ending the season with a Two Miles at Crystal Palace on 15th September where 8:31.15 was good enough for sixth. Summer 1990 would be Ian’s first Commonwealth Games medal and the winter leading in to it was impressive. As was his custom, he raced sparingly over the winter and his first race was in November. On 17th September he raced in the Munich v Edinburgh/Scotland Select at the Olympic Stadium in Munich and won the 1500m in 3:43.40. Then it was on to the roads and the Glasgow University Road Race on 11th November. Here he defeated Nat Muir in a controversial finish – he had been selected for the Games by this time (a late inclusion) – he was one of six together going on to the track and Nat looked like the winner, 30 yards or so from the line, Hamer couldn’t go round Nat so he stepped up on to the grass infield and passed him that way. There were cries of ‘foul’ from some who saw it but Ian commented if officials felt like complaining, they should see what goes on out on the roads. He did not the course, he did not impede Muir and since the grass surface was inferior to the cinders he did not gain an advantage. He also said that he wouldn’t have got within a minute of a fit Nat Muir. The result stood. He did not run in the Edinburgh to Glasgow the following week. With the Commonwealth Games in New Zealand at the end of January there were no cross-country races for the end of the year. After the long journey there, his first pre-Games race was in a 3000m in in Sydney, Australia, on 14th January where he ran 7:50.9 to finish third. This was followed by a Warm Up meeting in Auckland six days later, also over 3000m, where he was second in 7:46.40. In the race itself, he was third in 13:25.63 behind Andrew Lloyd (Australia) in 13:24.86 and John Ngugi (Kenya) who ran 13:24.94 and in front of Kerry Rodger, Moses Tanui, Paul Williams and eight more top class runners including Yobes Ondieki who was reckoned by some to be favourite for gold. Unfortunately not one of them was a Scot. The race was not without incident however. Doug Gillon reports: “The 5000m developed into one of the most sensational and dramatic of all time, with three of the leading contenders falling. After only two laps the favourite, John Ngugi, and England’s European champion, Jack Buckner, crashed to the track. Amazingly, by 1200 metres an adrenalin surge had carried Ngugi once again to the front of the pack, while Buckner essayed a more conservative approach. Even more amazingly, Ngugi proceeded to draw clear. Then came the second fall, at the same spot, two laps later. Yobes Ondieki, ranked Number One in the world last year, determined that his compatriot would not steal away for the gold, attempted to close him down. But he too hit the track. The pursuing pack split asunder under Ngugi’s pressure and England’s Mark Rowland and Canada’s Paul Williams were clear of the rest with the minor medals to fight out between them. Suddenly the pursuit hotted up, Rowland and Williams were sucked up 600 metres from the finish and it was any one from six for silver and bronze at the bell. Ngugi, loping casually along with his ungainly action, seemed to have won easily, being some 5 seconds clear with a lap to go. Then, with 300 metres to go, Welshman Ian Hamer struck with a devastating surge, drawing Australia’s Andrew Lloyd with him. Lloyd’s surge lasted the longer, but even 30 metres from the line Ngugi’s lead seemed impregnable. The crowd noise was deafening and it drowned the sound of the Australian’s softly-softly approach. As Ngugi eased at the line, Lloyd lunged past to take the gold, winning by eight-hundredths of a second in 13 min 24.86 sec. Hamer sliced an incredible 20 seconds from his best to take bronze. There is more coverage of the race in “Scotland’s Runner” of March 1990 in David Jones’ “Impressions From Auckland.” As if to prove that his talents were not restricted to track, he then won the World University Cross-Country Championships. This is a biennial championship, started in 1968 and in which 64 countries have taken part (although only three – Britain, France and Spain – have taken part in all championships. 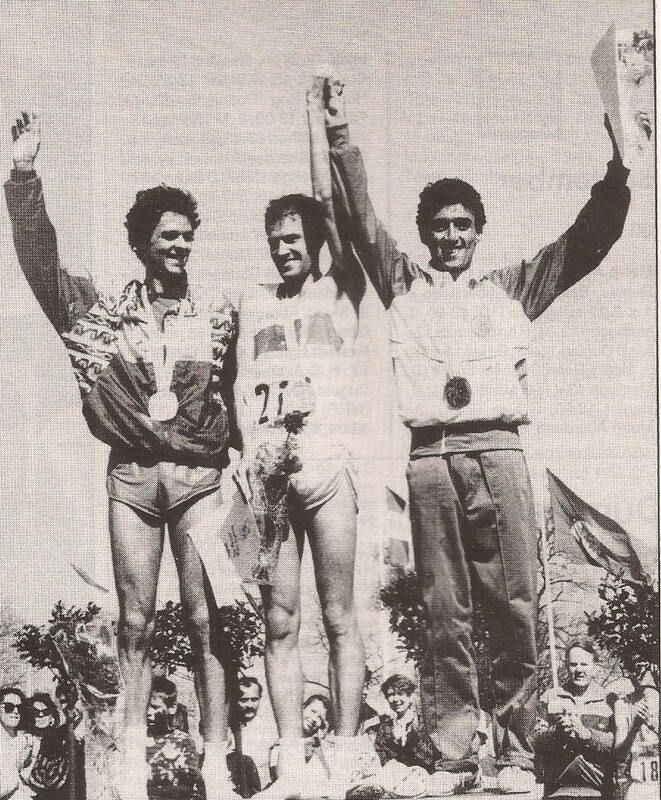 The 1990 event took place on 1st April in Poznan, Poland, and Ian won in 28:02 from Antonio Serrano (Spain) who was seven seconds back, and Haydar Dogan (Turkey) who was another two seconds away. The last time that Britain had won was in 1976 when Scotland’s Laurie Reilly did so. Back home, there were three indoor races in Glasgow’s Kelin hall at the end of February and the first half of March where he recorded 7:55.75, 7:57.91 and 7:58.15. He was clearly going exceptionally well and he went even better in the British Universities Championships in Antrim at the start of May, Ian set a new championship record in winning the 10000m in 28:30. On 6th July in Edinburgh there was another very quick 3000m (7:50.95) and on the sixteenth in a 1500m in Belfast he ran 3:39.95 for fourth place. On the twenty eighth of the month at Wrexham he ran in a 1500m in which he was second in 3:41.13. At the end of August and start of September, the European Games were held in Split, Yugoslavia. He ran in the 5000m and although he made the final, there was no medal this time for a tired Ian Hamer, who finished twelfth in 13:32.61 – one place and two seconds in front of Eamonn Martin while Gary Staines was second in 13:22 .45 in a finish where less than a second separated the first three. The summer ended on 12th September in a BMC race at Bristol where he ran a Mile in 4:01.4. He won it. This ended a season which started in January in Australia and took in top class events in Australia, New Zealand, Scotland, England, Ireland, Wales, Yugoslavia and Poland. His best times for the season were – 800m 1:54.0i; 1500m 3:39.95; 1 Mile 4:01.4; 3000m 7:46.40; 5000m 13:25.63; 10000m 28:30.44. Impressive as the times were, the competitive record was at least as good with many world class scalps in his collection. “The choice had been made simple by Ian’s outstanding performances at four major championships. The good news for the future is that Ian will be remaining at Heriot-Watt for a further two years during which time he will be studying for an MSc in construction management. The year began in whirlwind fashion for Hamer. Selected at the last minute for the Welsh Commonwealth Games team, he travelled to Sydney in late December. After a few weeks spent acclimatising, he travelled on to New Zealand, where he ran a Welsh record in the 3000m (7:46). His aim in the Games was to reach the 5000m final, but it is now history that he ran a superb race to bring home the bronze medal in a time of 13:25. The 5000m was the most exciting and eventful race in the Games, but Ian stayed out of trouble and more than justified his selection. Almost immediately after returning from Auckland, and while still caught up in the euphoria of his medal winning run, he was selected to run for Britain in the 3000m at the ill-fated European indoors in Glasgow. Owing to a mix-up by the officials, Ian left the arena on Saturday believing that he had been eliminated. The following morning, having been out for a training run, he was told that he was in the final. He failed to live up to his own expectations in the final but that is hardly surprising in the circumstances. Typical of Ian is his attitude to this race. He says that if he had been going to win, he would have won regardless of the problems. In retrospect he admits that it was not meant to be and that perhaps he was wrong to run in the first place. After the indoor season, he returned to the cross-country scene for the World Student Games in Poland. He was in a different class at this event and won gold for Britain. Ian then returned to his books in an effort to pass his final exams at university. Despite his absence for two months at the Commonwealths, and his hectic training schedule, he still managed to get his degree. The absence from the track during the exams probably left him with little realistic chance of a medal in Split. Despite this however he reached the final of the 5000m and had a crack at a medal. The problem that he faced was the heats. In Auckland the heats were more comfortable and there was an extra day to recover before the final. In Split he had to run a 4:10 mile in the middle of the heat to ensure that he qualified. With his limited experience of major championships, he found it all a bit too much. What does the future hold for the young Welshman? His post-graduate course lasts two years, which will take him through the World Championships and to the Olympics in Barcelona. He also has his sights set on the World Student Games in Sheffield in 1991. In the days of semi-professional athletics, it is disappointing to note that despite his success and great potential, he has been unable to attract a major sponsor to support his quest for further medals. His tution fees for the MSc are being paid by his parents, and his ambitions may be thwarted b y lack of funds. When there appears to be so much money in the sport at present, there must be something wrong when none of it comes the way of such a talented young man. The experience he gained at the Europeans and the Commonwealths can only help his quest for gold. Ian’s first race the following winter was at Livingston on 29th September where he won the Livingston and District Open Road race in 30:45 from Tommy Murray (31:04) – a significant gap bearing in mind Tommy’s form at that time. Missing the cross-country relays, the next outing was in the Edinburgh to Glasgow on 18th November he had an excellent race on the second stage moving from sixth to second in what would have been the fastest time of the day but for an even better run by an Englishman: John Sherban was having his first run in Falkirk Victoria Harriers club colours and went from eighth to first. Colin Shields in “Scotland’s Runner” said, “The second stage witnessed a brave run by Falkirk’s new signing, World Student Games runner John Sherban. Despite a fall on the newly instituted overbridge crossing of the old roundabout, which caused him gashed arms, legs and a bleeding nose, he recorded the fastest stage time to gain seven places and hand over a narrow five seconds lead from Ian Hamer (ESPC).” By the start of the new year, he was back on the boards of the Kelvin Hall and won the Scottish Universities Indoor Championship 3000m in what Gordon Ritchie described as a ‘solo run to victory’ in 8:03.5 – the second runner clocked 8:8:50.3. 1990-91 was to be his last real season in Scotland and his best times were – with one exception – done outside Scotland. They are all remarkably good and noted in the following table. Competitively it was a good year although he was most unlucky in the World Championships 5000m heats. 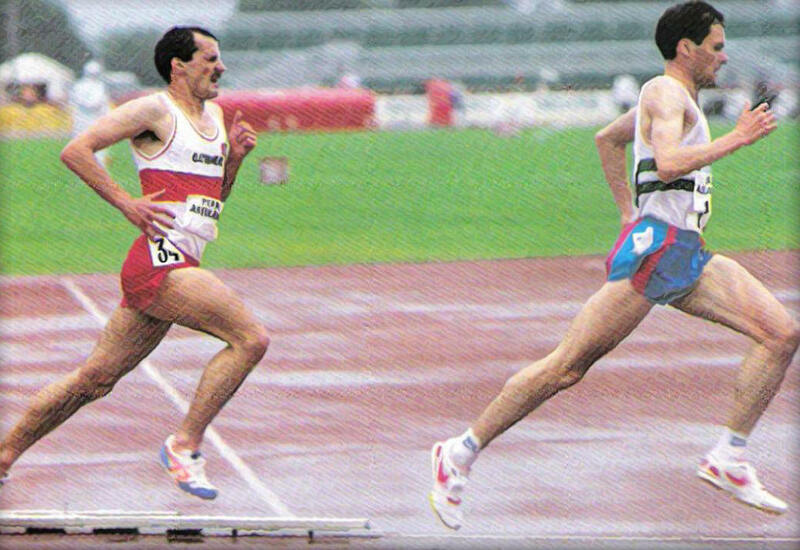 The event had been held every four years but from 1991, the World Championships were to be held every two years and Ian was picked to run in Tokyo. First though, in the AAA’s Championships in Birmingham on 26th/27th June, Ian was second in the 5000m to Eamonn Martin (13:32.99) in 13:33.66 with John Sherban third in 13:39.43. He was selected for the World Championships in Tokyo in 1991 where he ran n the 5000m but, running in the third heat, he finished sixth in 13:54.49 and failed to qualify for the final. The race was won by Brahim Boutayeb (Morocco) in 13:53.75 from Dieter Baumann in 13:54.07, Stefano Mei (Italy) in 13:54.35, Dionisio Castro (Portugal) in 13:54.39, and Ondoro Osono (Kenya) in 13:54.41. Six men covered by less than 0.75 seconds! Neither that winter nor the following summer, 1991 – 1992, did Ian did not race in any of his usual races North of the border but it was a good year for him He was second in a Grand Prix in Rome in June in 13:09.8 which placed him third on the UK All-Time list, and in the Barcelona Olympics he was fourth in the fifth heat in 13:40 and did not qualify for the final..
Ian had been a student in Scotland, from 1987 to 1991 and crammed in a lot of good running – the highlights are here but there were many other excellent races (eg Scottish Universities cross-country champion in 1989) and he did add to the high standard of endurance running in Scotland at the time.